This post goes up with a major shoutout to my Uncle David–soon after having to return one of my favorite (borrowed) cookbooks of the last several months, Yotam Ottolenghi’s Plenty, to its rightful owner, Ottolenghi’s new book, Jerusalem, arrived in the mail as a birthday gift. It’s a beautiful book, part travelogue, part cultural history of the city’s many population, and all beautiful cookbook. This recipe jumped out at me as Diana and I have been enjoying the tahini sauces which are often featured at our favorite lunch spot. I’ve been trying to make sure that vegetables still get their place in my dinners lately even though all I want to eat is cheesy, carb-y comfort food to cope with the winter. This dish is warm, rich, but still full of bright flavors and original flavors. Preheat oven to 475. 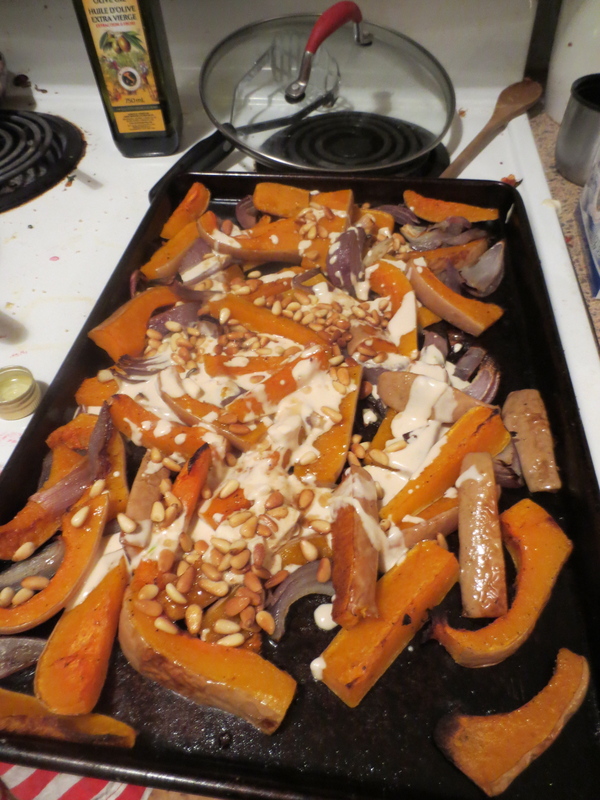 Toss squash and onion wedges on a baking sheet with 3T of the oil, salt, and pepper until well coated. 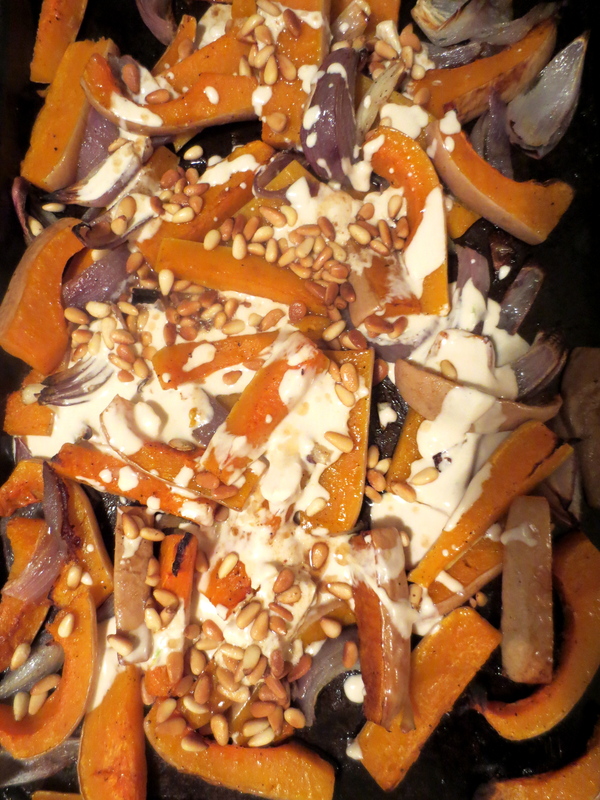 Spread out on the baking sheet with the squash skin down and roast for 30 – 40 minutes, keeping an eye on the onions since they might cook faster. Meanwhile, make the sauce by mixing the tahini, lemon juice, water, garlic, and 1/4 tsp salt and whisking well, adding more water if necessary. You want it to be a little thinner than honey. Saute the pine nuts in the remaining 1T oil and 1/2 tsp salt over medium-low heat, stirring frequently, until golden brown. Keep a sharp eye on them as burnt pine nuts are one of the saddest events that can happen in your kitchen (except for the time pantry moths got to our Costco bag of pine nuts and the whole thing had to be thrown out). Be aware that even after you remove them from the heat, they may still keep cooking in the hot pan and should be put in a separate bowl. 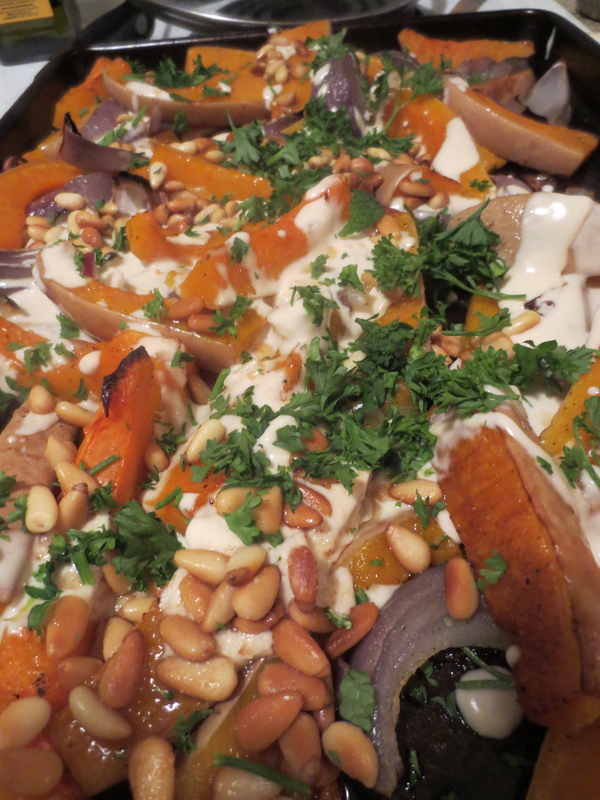 When the veg is done, drizzle the tahini over the top, followed by pine nuts and their oil, and parsley as a finishing touch.